Friedrich Paul Berg wrote: When holocaut hoaxers like Hans get into trouble, as in this "debate," they sometimes speak of a "convergence of evidence." All they really have is a "convergence of extremely shoddy evidence"--which falls apart as soon as one understands what was really going on, generally--at the same time. During the German show trials in the 1960's from where Hans took much of his "evidence," did the existence of producer gas vehicles come up anywhere? I doubt it--in large part because few people even knew or remembered that special wartime technology. Did any defense attorney even think of mentioning it as a possible alternative explanation for what prosecutors were claiming? I doubt it. Those proceedings were a terrible sham. Judge Wilhelm Staeglich wrote a superb book--Auschwitz: A Judge Looks at the Evidence--about just how the defendants were framed--but anyone familiar with criminal proceedings, even in the nearly perfect USA, knows full well how easily plea deals are made ALL THE TIME, every day, to get useful but false testimony from people--even against their will, even without any overt physical torture. It is instructive that Fritz calls the West-German investigations into the paramilitary units employing homicidal gas vans as "sham" although he knows next to nothing about these. The claims of homicidal gas vans were made by numerous German witnesses themselves. The simple fact that none of the Germans has described something resembling the producer gas setup allows to safely rule out that they were confusing or forced into confusing producer gas vehicles for homicidal gas vans. For instance, Stäglich speculates on the defendant Hofmann that he admitted gassings in Auschwitz at the trial because his other case on murder in Dachau, where he was already convicted to life sentence, had been reopened. However, Hofmann admitted homicidal gassings already at his interrogation of 22 April 1959 and his participation in gassings in his interrogation of 3 March 1960. At this time, his Dachau case was not even finished (19 December 1961) let aside reopened (11 March 1964). Therefore, this motive Stäglich attributed to Hofmann is purely fictional. And he did not show that Hofmann gave a false testimony on homicidal gassings to begin with. Friedrich Paul Berg wrote: Not that long ago, people were prosecuted for "conspiring with the Devil." Just imagine a case being made for flying from Boston to Salem on the coattails of the Devil himself--in just minutes based, of course, on "credible eyewitness testimony." The case might be convincing to a host of ordinary jurors--until one learns that a commuter airline was available to carry everyone w-i-t-h-o-u-t any supernatural help. That would in itself be NO PROOF that the Devil was not involved--but it would, I dare say, have blown the prosecution's case out the window. To insist as Holocaust hoaxers do that during WW2 the Germans burned precious gasoline--a strategic commodity of enormous importance, especially to resource-starved Germany--just to make carbon monoxide for mass murder--is one of those incredibly stupid ideas that fails when one learns that the same resource-starved Germans made vast quantities of carbon monoxide directly from woodchips--that were almost as cheap as dirt, and available almost anywhere and everywhere. To make this long story short: Since Fritz failed to demonstrate that the Germans would not combust gasoline for their homicidal gas vans (see also my previous rebuttal here), he did not show that the perpetrators gave false testimony to West-German investigators and therefore has offered nothing specific to raise doubts on these testimonies. On my [from Hans] quote of the German producer gas expert Eckermann that the conversion to producer gas meant "reduced perfomance, poorer effeciency, cumbersome handling, higher maintenance and new supply provisions", Fritz simply declares it is "totally false and absurd", yet without explaining and showing what is supposed to be false and absurd here. I don't need to elaborate the point further, since deciding between the opinion the German producer gas expert Eckermann and Fritz is too obvious. Hans' claims in the first sentence I quoted above are totally false and absurd. The major reason producer gas vehicles should have been employed is that the Germans were desperately short of gasoline--even within Einsatzgruppe B. Hans' own source above clearly says they had received "only amounts of 200-400 Liters." That is ONLY about 100 gallons of gasoline for all of Einsatzgruppe B! How many Jews and/or Soviet citizens could they have possibly murdered with that, assuming their vehicles had nothing else to do for that entire month? But, with producer gas vehicles they certainly could have murdered millions since the essential fuel, woodchips, was almost everywhere and almost as cheap as dirt. It was Hans' "claim" that was "totally false and absurd" but NOT Eckermann's. Big difference! As to what Eckermann wrote, I happen to agree with Eckermann completely. With producer gas there is, indeed, reduced performance, poorer efficiency, etc.--but if one has no gasoline at all, the producer gas option allows one to still keep moving and working for the defense of the Reich and civilization, gassing Jews and partisans, or whatever. Hans' LIE above is, however, an essentiaL LIE for creatures like himself. He dare not admit, ever--even for an instant--that producer gas vehicles (Holzgaswagen or Generatorgaswagen in German) would have made perfect sense if the fiendish Germans in WW2 had ever wanted to gas people with carbon monoxide. That would be the same as admitting that the holocaust story really is the dirty, racist hoax that it truly is. Hans' lie above is just one of many gross distortions in his three posts of a few days ago. Hans does not even seem willing to admit there was a critical shortage of gasoline for the entire German military as well as Europe generally. The pictures he showed from The Auschwitz Album from 1944 are at least partly explained by the fact that in 1944 Auschwitz had its own supply of gasoline from the syn-fuel plant at Monowitz (where Elie Wiesel suppposedly worked also). For all his efforts and bad "evidence," Hans gets a big fat ZERO from me. I will have more to say later. Last edited by Friedrich Paul Berg on Tue Apr 03, 2018 11:25 am, edited 3 times in total. A major reason to be furious and disgusted with Faurisson and Leuchter is that they undermine excellent arguments against the holocaust hoax with their gross stupidity about mass gassings being "impossible" or "practically impossible"--for whatever reasons. The Germans had superb "gas chambers" throughout Germany. They were actually "gas-tight bombshelters" and were required by law even before the war started. Those superb bombshelters were the major reason for why the western Allies did not murder far more than the 600,000 innocent civilians they seem willing to admit "killing." An excellent book on this subject is: The Gas Chambers of Sherlock Holmes by Samuel Crowell (2011). He just escaped the gas chamber and has to tell the whole world. "DIN-4104 forever and ever!" The fiendish Getmans were obviously getting ready to gas the entire world! They had even built gas chambers in ordinary houses! Is the image below a recruitment ad for people to drop Zyklon-B into gas chambers filled with Jews? Why not? Mauser, world famous for its rifles, also made emergency escape hatches as well as gas-tight, bombshelter doors (all with peepholes)–see lower right. This was not some “secret” or obscure Nazi technology. On the contrary, everyone was openly encouraged, and even required, to construct gas-tight shelters wherever appropriate--in all apartment and factory buildings, for example. The illustrations–above and below –are from Luftschutzraum Bauweisen by Dr. Ing. Frommhold, 1939. This ad seems self-explanatory? “It conforms to latest German standard DIN 4104.” Peephole is present as always. Mannesmann, world-famous for its seamless steel pipe and much more, also made emergency escape hatches. In this ad we see an emphasis on the gas-tight seals. The air raid warden is wearing a gas mask for protection against gas accumulations from broken gas mains, from partial fire combustion as well as from actual gas attack from the air. But, if one really wants to believe in the Holocaust myth, he could have been dumping Zyklon-B into the bombshelter. Typical advertisement for a steel, gas-tight bombshelter door–with obligatory peephole (Guckloch). Another advertisement, one of many in the German construction literature for architects, engineers and contractors–with the same gas-tight, bombshelter door and peephole. Both advertisements above–left and right–are from Luftschutzraum Bauweisen by Dr. Ing. Frommhold, 1939. A SUPER Peephole disguised as mail-box? The ordinary peephole (Guckloch) was sometimes replaced with an automatic, adjustable high pressure valve which still allowed viewing into the bombshelter by any air raid warden. If any structural damage during a raid prevented opening of the door, one could by dropping the peephole assembly slightly still pass messages through as shown. Water could also be passed through a hose through any peephole with the sightglass removed. Medicines and food could be passed through as well. Pictures are from Schutzraumabschlüsse (Bombshelter Locking Devices) by Dr.-Ing. R. Scholle from 1939, page 32. Obviously, this was all part of a long-range plan to exterminate everyone in the entire world except for their own kind. And the Nazis were so fiendish that they had literally many thousands of these gas-tight shelters ready and waiting to gas millions more–right there in their own backyards and cities. Very interesting-Yes! Gas chamber doors with removable Monocles. Erich von Stroheim would be so happy.. The major piece of evidence on display in the US Holocaust Museum in Washington, DC is a “replica” of a supposed homicidal gas chamber door from Maidanek which is nearly identical to the standard, gas-tight doors used throughout German-occupied Europe to keep people alive during air raids. The use of poison gas in such attacks on civilians was anticipated long before the war even started. The peephole as well as the gas-tightness of the construction must seem especially incriminating to most visitors. An ordinary door would have meant nothing--but add that peephole and suddenly one has, my goodness–“damning and undeniable evidence.” However, when one understands something about such doors and how widely they were actually used in Germany, it becomes obvious that the Holocaust museum officials and “scholars” are only showing, once again, their own gross incompetence and willful ignorance. Using their logic, there must have been tens of thousands of homicidal, gas chambers in active use throughout Germany. In reality, the museum “evidence” is “proof” of the utter stupidity–and nothing else–upon which the hoax is still based. Bombshelters as Gaschambers. Every gas-tight bombshelter, of which there were many tens (hundreds?) of thousands in Germany and German-occupied Poland, could have been easily used to slowly asphyxiate any group of intended victims by merely shutting the fresh air supply vents and ducts. Also, instead of blowing air into such chambers using peepholes as shown above, poison gas could have also been introduced using the very same peepholes or any air intake openings. 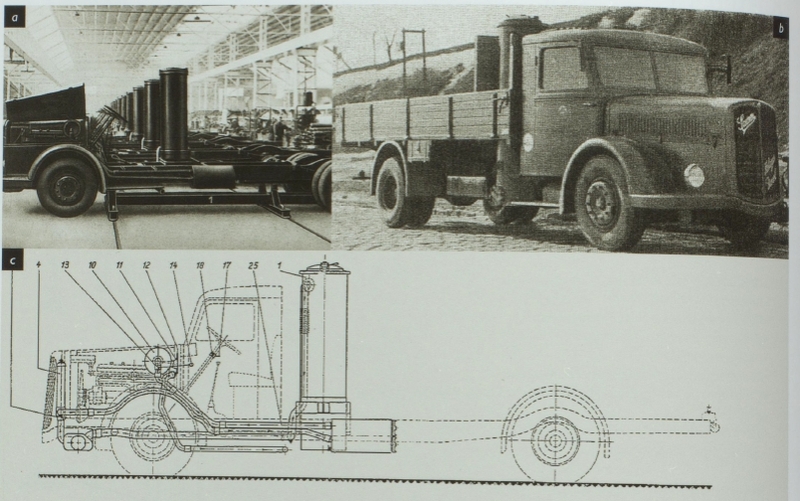 Instead of the test blower shown above (bottom right), one could have connected a hose or pipe to the startup-blower (Anfachgebläse) on any of the more than 500,000 producer gas trucks in service throughout Germany-occupied Europe–—the end result, death from the 35% CO in the producer gas. If mass exterminations had ever been planned, there was certainly no need to ship intended victims to remote locations in Poland to be gassed with diesel exhaust or Zyklon-B in makeshift cellars or wooden shacks. Everything needed, and more, was right there in Germany itself or, for that matter, anywhere in German-occupied Europe. If the Allies had ever bombed the supposed homicidal gas chambers in Auschwitz, they would have done the Nazis a favor. The dastardly deeds could have been done almost anywhere else –and the millions of Reichsmarks saved just on transportation could have been used to perpetrate other dastardly deeds instead. This is all the more good reason to reject the Holocaust gassing claims as absurd nonsense and unbelievable. Last edited by Friedrich Paul Berg on Tue Apr 03, 2018 11:25 am, edited 1 time in total. It was Hans' "claim" that was "totally false and absurd" but NOT Eckermann's. Big difference! Except that it is not a "lie" - least a "shameless" one, since I would be really ashamed if I had to lie to you - but a simple misunderstading facilitiated by your misleading plural "claims" when I made only one claim and your complete silence on the argument that producer gas vehicles offered "reduced perfomance, poorer effeciency, cumbersome handling, higher maintenance and new supply provisions" and that they were therefore inedequate for the paramilitary forces and as chassis for their homicidal gas vans. Sorry for this misunderstanding, but now's time to relax again, Fritz. As to what Eckermann wrote, I happen to agree with Eckermann completely. With producer gas there is, indeed, reduced performance, poorer efficiency, etc.--but if one has no gasoline at all, the producer gas option allows one to still keep moving and working for the defense of the Reich and civilization, gassing Jews and partisans, or whatever. But the German paramilitary did not have "no gasoline at all". You have totally failed to demonstrate this. As I have shown in a previous posting, the German paramilitary forces did have access to large supplies of gasoline and precisely for the reasons outlined by Eckermann, they were excluded from the regulations to switch to non-liquid fuels. Since the police and SS was given large contigents of gasoline including from the army, there was no reason for them to introduce inferior performing producer gas vehicles in 1941/1942. You have not tackled this argument yet. The pictures he showed from The Auschwitz Album from 1944 are at least partly explained by the fact that in 1944 Auschwitz had its own supply of gasoline from the syn-fuel plant at Monowitz (where Elie Wiesel suppposedly worked also). The IG Farben complex near Auschwitz did not produce any gasoline. According to the history of the BASF company (Abelshauer, Die BASF: eine Unternehmensgeschichte, p. 331), the site "never produced rubber and fuel". What's more relevant is that the factories were producing for the armaments industry and military, so this would still not explain why the Auschwitz SS could waste liquid fuels by driving around clothings instead of using producer gas vehicles which "essential fuel, woodchips, was almost everywhere and almost as cheap as dirt". As a matter of fact, just having a gasoline factory nearby does not yet enable access to its product. Somebody had to approve the gasoline contigent of the Auschwitz SS first. Likewise, contigents of gasoline were assigned to the Einsatzgruppen and Sonderkommando Chelmno, which spared them from using producer gas vehicles. Last edited by Hans on Sat Nov 26, 2016 8:39 pm, edited 8 times in total. Friedrich Paul Berg wrote: "S-wagen" was an ordinary German abbreviation which simply meant "standard wheel drive" or two-wheel drive. That was to distinguish that kind of vehicle from an "A-wagen" which was for "All-Rad" or all-wheel-drive, generally known today as four-wheel drive. For the muddy roads common in Russia, "A-wagen" were preferred if you could get them. Becker wanted them instead of what he had. The terminology had nothing to do with "Sonderbehandlung>" All German trucks were either S-wagen or A-wagen. Ingrid Weckert explained all this in her superb essay. Once again, the hoaxers are "full-of-crap"--as usual. Neither Weckert nor you have provided any example of the use of "S-Wagen" as meaning standard wheel drive, not in general but more importantly also not specifically in the RSHA and Security Police motor pool departments. Furthermore, there is no evidence for such a meaning specifically in the telexes from [url=ttp://holocaustcontroversies.blogspot.de/2015/10/contemporary-german-documents-on.html#_doc12]Heinz Trühe to the RSHA[/url] of 15 June 1942 and from the [url=ttp://holocaustcontroversies.blogspot.de/2015/10/contemporary-german-documents-on.html#_doc13]RSHA to the commander of Security Police and Security Service Ostland[/url] of 22 June 1942. The actual meaning of "S-Wagen" is revealed in the earlier telex from Emanuel Schäfer to Friedrich Pradel of 9 June 1942, where the "S-Wagen Pol 71463" is also designated as "Spezialwagen-Saurer". Hence, S-Wagen was simply the abbreviation of Spezialwagen (special vehicle) in the RSHA motor pool department. To the RSHA. – ROEM. 2 D 3 A - Berlin. Secret State Matter. At the commander of the SIPO a. the SD. Belarus a transport of Jews arrives weekly which is to be subjected to a special treatment. The 3 S-wagons existing there do not suffice for this purpose. I request the allocation of another S-wagon (5 tons). Furthermore I request at once to also send 20 exhaust hoses for the existing 3 S-wagons (2 Daimond, 1 Saurer), as those available are already leaky. The Comm. of SIPO a. the SD. Ostland Roem. 1 T – 126/42 GRS. [secret state matter] A. sgd. : Truehess. HStuf. 1) When can the deployment of another S-wagon be expected? 2) Are spare exhaust hoses available, on order or when deliverable? Now, what kind of "special treatment" (which was the default euphemism for killings, see Mattogno's special treatment of evidence and Rebuttal of Mattogno on Auschwitz, Part 5: Construction Documents) were the Nazis doing in Minsk on the "transport of Jews" using the "3 S-wagons (2 Daimond, 1 Saurer)" with "exhaust hoses"? What further supports we are dealing with gas vans here is that the license plate POL 71463 of this "Saurer special vehicle" intended to support the mass extermination of Jews in Minsk according to the telexes was registered right after another "gas van...Saurer POL 71462" of Einsatzkommando 8 according to the operational and situation report of Einsatzgruppe B of 1 March 1942. Friedrich Paul Berg wrote: I began this debate by asking Hans what gas was used to kill the gas van victims. His answer was: "Gasoline engine exhaust." My followup questions to that are: What fuel was used in the gasoline engine? Was it gasoline? Why? Why not producer gas? How can Hans, or anyone, be certain that the fuel was not producer gas since that was rather common--especially for Saurer vehicles? The use of gasoline as fuel for the German homicidal gas vans follows from the evidence. There are some hundreds testimonies on the Nazi gas vans, thereof more than 100 eyewitnesses providing further details on the vehicles. None of these testimonies described anything resembling a producer gas setup, although such was either readily visible or even if those fiendish Germans managed to camouflage it, it could not have escaped at least the drivers of the gas vans, the members of the Einsatzgruppen motor pools and the car mechanics in Kolo (drawing from Jerzy Fojcik of 6 July 1945, BArch B162/21962, p. 359). In contrast to this, many witnesses have explicetely mentioned that gasoline was used as fuel for the gas vans (you will like the one of the motor pool head of Einsatzkommando 8 that the gas vans consumed too much gasoline for his taste). Of course, that would immediately raise the follow-up question, at least for technically informed people, of why the Germans would be so stupid! Why wouldn't they have simply used the producer gas directly (up to 35% CO) from inexpensive woodchips to kill rather than make a far less deadly gas (only about 12% CO) by a bizarre round-about method (skip the engine completely) using an expensive, strategic commodity, essential to Germany's war effort and "survival?" It was a life or death issue for Germany as a whole. Were the Germans really that stupid? I don't think so. Why would they use gasoline which was so precious instead of wood chips which were so cheap--and readily available? I have already briefly addressed the main reasons for using gasoline engine exhaust here and the availability of gasoline to the paramilitary forces here. Friedrich Paul Berg wrote: A major reason to be furious and disgusted with Faurisson and Leuchter is that they undermine excellent arguments against the holocaust hoax with their gross stupidity about mass gassings being "impossible" or "practically impossible"--for whatever reasons. The Germans had superb "gas chambers" throughout Germany. They were actually "gas-tight bombshelters" and were required by law even before the war started. Those superb bombshelters were the major reason for why the western Allies did not murder far more than the 600,000 innocent civilians they seem willing to admit "killing." An excellent book on this subject is: The Gas Chambers of Sherlock Holmes by Samuel Crowell (2011). Just what have your bomb shelters to do with the Nazi gas vans, which were constructed for the decentralized killings of the Einsatzgruppen in the occupied Soviet Union? Absolutely nothing. It's probably not a good sign that we are just on page 4 of this "debate" and you already resort to spamming with an irrelevant wall of texts and pictures instead of addressing my postings and delivering actual evidence for your assertions. Lying "Hans" is back even after I showed that he craftily lied about my relation to Eric Eckermann's writings. Hans LIED but is NOT man enough to admit it or even apologize. I never claimed anything Eckermann wrote was "totally false and absurd", But now, lying "Hans" tells more lies. After taking some of my words "out of context," Hans now claims: But the German paramilitary did not have "no gasoline at all". You [Berg] have totally failed to demonstrate this. As I have shown in a previous posting, the German paramilitary forces did have access to large supplies of gasoline and precisely for the reasons outlined by Eckermann, they were excluded from the regulations to switch to non-liquid fuels. The German police forces (Einsatzgruppen) did have "severely limited" access to large supplies of gasoline. Big difference! If the alotted gasoline was consumed, there might not be any gasoline left at all for unfinished tasks. What to do then? Sit alongside the road and wait for a new alottment--or an attack by partisans? That is all I meant and any honest reading of my text must recognize that. Yisrael Gutman; Michael Berenbaum; David Wyman (1 January 1998). Anatomy of the Auschwitz Death Camp. Indiana University Press. p. 577. ISBN 978-0-253-20884-2. "In May. General Ira C. Eaker, commander of Allied air forces in Italy. pointed out that strikes on Blechhammer could be carried out simultaneously with attacks on war industries at Auschwitz and Odertal." "By may 1944. the 15th Air Force had turned its primary attention to oil targets. …the close attention paid to oil in 1944 and 1945 was one of the most decisive factors in Germany’s defeat. …In late June, the 15th Air Force was about to move the oil war” into upper Silesia, …. Eight important oil plants were clustered within a rough half-circle 35 miles in radius, with Auschwitz near the northeast end of the arc and Blechhammer near the northwest end. Blechhammer was the main target. Fleets ranging from 102 to 357 heavy bombers hit it on ten occasions between July 7 and November 20. But Blechhammer was not the only industrial target. All eight plants shook under the impact of tons of high explosives. Among them was the industrial section of Auschwitz itself." Yisrael Gutman; Michael Berenbaum; David Wyman (1 January 1998). Anatomy of the Auschwitz Death Camp. Indiana University Press. p. 578. ISBN 978-0-253-20884-2. "Late in the morning on Sunday. August 20. 127 Flying Fortresses, escorted by 100 Mustang fighters, dropped 1,336 500-pound high-explosive bombs on the factory areas of Auschwitz, less than five miles east of the gas chambers. The weather was excellent… ideal for accurate visual bombing. Antiaircraft fire and the 19 German fighter planes there were ineffective. Only one U.S. bomber went down; no Mustangs were hit." "All eight plants shook under the impact" but the homicidal gas chambers and the RR tracks to them were untouched. Oh my--oh my! Such American negligence must be compensated for with millions of shekels and dollars for Israel and "survivors." I dare say that with 8 syn-fuel plants within a radius of no more than 47 miles, Auschwitz could "organize" more than enough gasoline to power a few trucks--if not from Monowitz, then from one of the other plants. Once again, Hans is full-of-crap. Last edited by Friedrich Paul Berg on Tue Apr 03, 2018 11:26 am, edited 1 time in total. The "S-wagen" arguments from Hans show how far removed Hans' is from reality. Hans should read the extensive automotive literature, postwar and wartime, instead of merely courtroom testimony manufactured to support the Soviet show trials. S-wagens were thoroughly described in several postwar reference books. One excellent book is: German Military Transport of World War Two by John Milsom (1975). That book contains more than thirty photographs, pages 155-167, of non-homicidal trucks with captions identifying them as "S-type." The S Type differed from the A Type essentially in that it lacked front-heel drive, but this could be built on as required. The A Type was intended for the Wehrmacht and the S Type for commercial use. [Footnore 1] The A type (Allradantrieb--All Wheel Drive) replaced the legLkw1.5t, and the S Type (Standard) replaced the Lkw up to 2 tons. This class of vejicles also became the sPkw. [Footnote 2] The A Type replaced the mgLkw3t, the S Type the mLkw3t. [Footnote 3] These two classes [d and e] replaced all previous lorries over 3.5 tons. Quickly, as to Sonder vehicles, I will just mention a few facts which are easy enough to verify in the postwar literature about German wartime military vehicles. There were by my last count, at least 250 different kinds of Sonderkraftwagen which were all designated by the numbers followed by "Sd Kfz" for Sonderkraftfahrzeug. Needless to say, none of those vehicles had anything to do with the "extermination" of Jews or anyone else--except as would occur in any legitmate military operations. Once again, the REAL facts show that Hans and his depraved ilk of racist liars and hatemongers have absolutely no idea as to what they are talking about when they insist that "Sonder" was some kind of euphemism or spooky codeword for mass murder. Last edited by Friedrich Paul Berg on Mon Jul 30, 2018 10:59 pm, edited 2 times in total. You are missing the point. Which was that "the German paramilitary forces did not bother about producer gas, but wasted gasoline instead". You have also ignored any of the other examples illustrating the point.